Let us look at the figures given below and observe their properties. They are bounded by 3 or more lines. They have 3 or more intersecting points. whose line segments intersect each other at their end points. 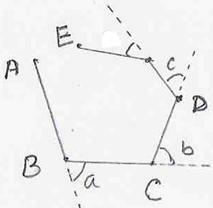 The end points where line segments meet are called ‘vertices’ of the polygon. The line segments which make the polygon are called ‘sides’ of the polygon. is called a ‘diagonal’. The adjacent figure has five sides and hence it is called pentagon. 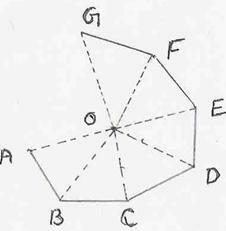 In a polygon, number of sides= number of angles = number of vertices. 1. Draw a regular pentagon – do you notice that all interior angles are equal to 1080? 2. Draw a regular hexagon – do you notice that all interior angles are equal to 1200? An ‘inscribed regular polygon’ is a regular polygon whose vertices are on a circle. 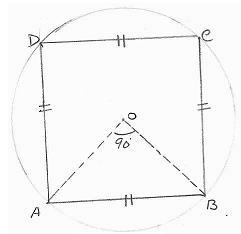 Step 1: Divide 3600 by the number of sides of the quadrilateral (=4) to get the angle at origin. Therefore angle at origin = 900 = 360/4. Step 2: With O as center draw a circle of radius 4cm. Step 4: With B as center cut an arc of radius =AB to cut the circle at C.
Step 5: With C as center cut an arc of radius = BC to cut the circle at D.
Step 6: Join the points A, B, C and D to get the quadrilateral ABCD. Step 2: With O as center draw a circle of given radius. Step 3: Draw 2 lines (OA and OB) from O with the angle between them = Angle at origin (arrived in Step 1). Step 4: With B as center cut an arc of radius=AB to cut the circle at C.
Step 5: With C as center cut an arc of radius =BC to cut the circle at D.
Step 6: Repeat step 5 till the last arc cuts the circle again at A. Step 7: Join the points to get the required polygon. Think why inscribed polygon of 7 sides is not included in the above table! 6.6.1 Problem 2: Difference between the exterior angle of (n-1) sided regular polygon and the interior angle of (n+1) sided regular polygon is 90. The regular polygon has 9 sides.